The Club runs a qualifying tournament for the All England Handicap Championship which is open to all club members. The winner and runner-up qualify for the Area Finals to be played on both days of the weekend 4-5 September at Newport, Essex. The winner and loser of the third place play-off between the losing semi-finalists will act as first and second reserve respectively should either of the finalists become unavailable for the Area Finals. The winner of this qualifying tournament will also become the last of the four semi-finalists in the internal Handicap Tournament. Matches will be 26pt games played off full bisque handicap to base 10 using current handicap (maximum 20) on the day the game is played, and played to a time limit agreed between the players (3.5 hours if no agreement). Both players in each match are responsible for contacting their opponent to arrange the match. Area Finals: Simon Hathrell and Geoff Johnson proceeded to the Area Finals at Newport, Essex. Geoff Johnson came a close second in the Area Finals, and proceeded to the National Finals at Budleigh Salterton on 18-19 September. 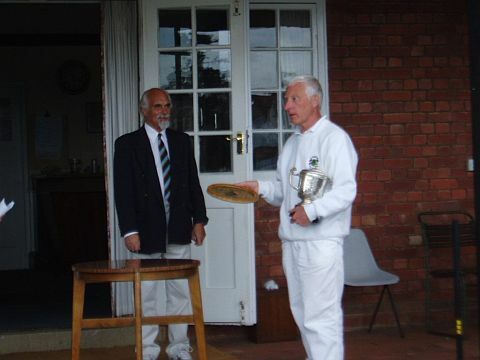 Congratulations to Geoff Johnson, who won the National Finals becoming the 2010 All England Handicap Champion.